Reducing taxes further for small businesses. Improving access to financing for Canadian small businesses. Expanding services of the Business Development Bank of Canada and Export Development Canada to help small and medium-sized enterprises. high-growth companies grow and create jobs. Providing $14 million over two years to Futurpreneur Canada in support of young entrepreneurs. Reducing the frequency of remittances for the smallest new employers. Launching the planning and preparation required for federal adoption of the Business Number as a Common Business Identifier. Modernizing Canada’s federal corporate governance framework to facilitate best practices, including increasing women’s participation in corporate leadership. The Government has worked to foster an environment in which businesses can grow and contribute to Canada’s long-term prosperity. It recognizes the vital role that small businesses play in creating jobs and generating economic growth, and that strong business strategies are central to a company’s success in creating and sustaining a competitive edge. Since 2006, the Government has taken significant action to support job-creating businesses by lowering taxes, cutting red tape and encouraging entrepreneurship. Further reduce taxes for small businesses. Improve entrepreneurs’ access to financing and advice. Reduce job-killing red tape that hurts businesses and entrepreneurs. Foster a greater role for women in establishing, growing and leading companies. These actions, together with Economic Action Plan 2015 initiatives to encourage investment, expand trade and connect Canadians with available jobs, will help entrepreneurs to grow their businesses and create jobs. Small businesses are critical to the health of the Canadian economy. They represent 99 per cent of all businesses in the country and employ half of all Canadians working in the private sector. Through reduced business taxes, improved access to finance, increased support for mentoring, and new tools and resources to assist entrepreneurs, the Government has encouraged and supported the growth and success of small businesses. To help small businesses grow and create jobs, the Government has delivered substantial ongoing tax relief to small businesses and their owners. This includes both a reduction in the corporate income tax rate for small businesses to 11 per cent and increases in the amount of income eligible for this lower rate to $500,000. Together, these changes are reducing taxes for small businesses by an estimated $2.2 billion in 2015 alone. Small business owners are also benefitting from increases to the Lifetime Capital Gains Exemption. On September 11, 2014, the Government announced further action to create jobs, growth and long-term prosperity with the introduction of the Small Business Job Credit. Almost 90 per cent of Employment Insurance (EI) premium-paying businesses, about 780,000 in total, will directly benefit from the credit. This credit is expected to save small businesses more than $550 million over 2015 and 2016, and will cut their EI premiums by nearly 15 per cent. Building on past support, the Government will continue to invest in policies that foster entrepreneurship and help small businesses to grow and thrive. Small businesses are of vital importance to Canada’s economic performance; their success remains a top priority of the Government. Reducing the small business tax rate to 11 per cent as of 2008 and increasing the amount of annual income eligible for this lower rate from $300,000 to $400,000 in 2007 and to $500,000 in 2009. Reducing the general corporate income tax rate to 15 per cent in 2012 from 22.12 per cent in 2007. This benefits successful small businesses when their income exceeds $500,000. Increasing the Lifetime Capital Gains Exemption (LCGE) on qualified small business shares to $750,000 from $500,000 in 2007. The Government further increased the LCGE to $800,000 for 2014 and indexed the new limit to inflation, bringing it to $813,600 for 2015. The LCGE is estimated to be delivering over $1 billion of federal tax relief annually to small business owners and owners of farm and fishing businesses. Providing $100 million to the Canada Accelerator and Incubator Program to help entrepreneurs create new companies and realize the potential of their ideas through intensive mentoring and other resources to develop their business. Doubling the budget of the Industrial Research Assistance Program with a further $110 million per year, to better support research and development by small and medium-sized firms through advice and financial support. Committing up to $400 million under the Venture Capital Action Plan to increase financing for innovative, high-growth companies. Saving Canadian businesses over $22 million in administrative burden, as well as 290,000 hours in time spent dealing with red tape, through the One-for-One Rule under the Red Tape Reduction Action Plan. Funding of $3 million per year, ongoing, to make BizPaL permanent. BizPaL is an online service that helps small businesses cut through red tape by creating a tailored list of permits and licences from all levels of government necessary to operate their specific businesses. Launching the Canada Job Grant to encourage greater employer participation in skills training decisions and ensure that training is better aligned with job opportunities. Supporting up to 1,000 internships for recent post-secondary graduates in small and medium-sized enterprises through a reallocation of $15 million annually within the Youth Employment Strategy. Unilaterally eliminating close to 1,900 tariffs since 2009, providing more than $525 million in annual tariff relief, and making Canada a tariff-free zone for industrial manufacturers. Opening new markets and supporting exporting businesses through the Global Markets Action Plan, which aims to nearly double the number of Canadian small and medium-sized enterprises exporting to emerging markets, from 11,000 to 21,000. In recognition of the important contribution that small businesses across the country make to job creation and economic growth, the Government announced the Small Business Job Credit in September 2014. The credit will provide relief to small businesses for Employment Insurance (EI) premiums paid in 2015 and 2016. The credit will be available to any firm paying employer EI premiums equal to or less than $15,000 in those years. The credit will effectively reduce small businesses’ EI premium rate by 28 cents from the legislated rate of $1.88 to $1.60 per $100 of insurable earnings. The credit is calculated as the difference between premiums paid at the legislated rate and the reduced small business rate. The credit is expected to provide savings of more than $550 million over the next two years for small businesses. Almost 90 per cent of all EI premium-paying businesses in Canada will receive the credit, reducing their EI payroll taxes by nearly 15 per cent. Economic Action Plan 2015 reaffirms the Government’s commitment to implementing the seven-year, break-even EI premium rate-setting mechanism in 2017. This Government understands that small businesses are a cornerstone of the economy—creating jobs that support families in our communities. That is why this Government has protected businesses from substantial rate increases in EI premiums to ensure stability and predictability for employers and employees. The Government’s actions to date include freezing the EI premium rate for employees at the 2013 level of $1.88 per $100 of insurable earnings until 2016. In 2014, this left $660 million in the pockets of job creators and their employees. The Government also introduced the Small Business Job Credit in 2014 to lower small businesses’ EI premiums from the current legislated rate of $1.88 to $1.60 per $100 of insurable earnings in 2015 and 2016. Any firm that pays employer premiums equal to or less than $15,000 in those years will be eligible for the credit. This is expected to result in a substantial reduction in the EI premium rate, from $1.88 in 2016 to an estimated $1.49 in 2017, a reduction of 21 per cent. A technology firm in Halifax, Nova Scotia, has 15 employees with average salaries of $40,000. The company’s Employment Insurance (EI) premiums are too high to qualify for the Small Business Job Credit. At a rate of $1.88 per $100 of insurable earnings, the company will pay $15,792 in employer EI premiums in 2015 and 2016. At the estimated rate of $1.49 in 2017, the company’s EI premiums will be reduced by $3,276 to $12,516. These are real savings that the company can reinvest to fuel growth and create new jobs. Economic Action Plan 2015 proposes to reduce the small business tax rate from 11 per cent to 9 per cent by 2019. Recognizing the important role of small businesses in Canada as job creators, the Government is committed to keeping taxes low for small businesses across the country. Canada’s federal income tax system supports small businesses through a preferential tax rate for Canadian-controlled private corporations with less than $15 million in taxable capital. The small business tax rate, which was reduced to 11 per cent in 2008, generally applies to the first $500,000 per year of qualifying active business income. This preferential rate allows small businesses to retain more earnings that can be used to reinvest and create jobs. Almost 700,000 small businesses benefit annually from this lower rate. 9 per cent effective January 1, 2019. It is estimated that this measure will reduce taxes for small businesses and their owners by $2.7 billion over the 2015–16 to 2019–20 period. 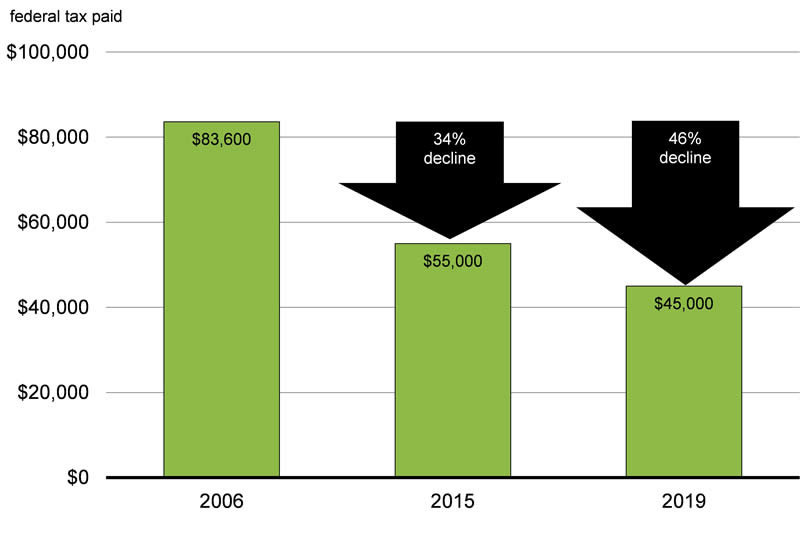 For example, as a result of actions already taken by the Government to reduce the small business tax rate and increase the amount of income eligible for that rate, the amount of federal corporate income tax paid by a small business with $500,000 of taxable income is 34 per cent lower in 2015 than in 2006 (Chart 3.2.1). When the proposed reduction in the small business tax rate takes full effect in 2019, the amount of federal corporate income tax paid by this business will be 46 per cent lower than in 2006. This represents an annual tax reduction of up to $38,600 that can be reinvested in the business to fuel its growth. A small business that operates a number of food trucks in the Kitchener-Waterloo region currently has $100,000 in annual taxable income. The proposal to reduce the small business tax rate to 9 per cent will reduce its federal corporate income tax bill to $9,000 by 2019—$4,120 less than it would have paid in 2006 (a reduction of 31 per cent). It can use this amount to invest in new equipment or to increase an employee’s hours. A small business based in Moncton offers career counselling and coaching. It has grown rapidly in recent years and its annual taxable income is currently $400,000. With the proposal to reduce the small business tax rate to 9 per cent, this business will pay $36,000 in federal corporate income tax in 2019—$25,480, or 41 per cent, less than it would have paid in 2006. These additional after-tax earnings can be used to acquire more suitable office space or to explore future growth opportunities. Economic Action Plan 2015 proposes to increase the Lifetime Capital Gains Exemption for qualified farm or fishing property to $1 million. The Lifetime Capital Gains Exemption (LCGE) for farm or fishing property provides an incentive to invest in the development of productive farm and fishing businesses, and helps farm and fishing business owners to accumulate capital for retirement. Budget 2007 increased the LCGE for qualified farm or fishing property to $750,000 from $500,000, the first increase in the exemption since 1988. Economic Action Plan 2013 further increased the LCGE for qualified farm or fishing property to $800,000 for 2014 and indexed the new limit to inflation, bringing it to $813,600 for 2015. To allow farm and fishing business owners to maintain more of their capital for retirement, Economic Action Plan 2015 proposes to increase the LCGE applicable to capital gains realized on the disposition of qualified farm or fishing property to $1 million. This measure will apply to dispositions of qualified farm or fishing property that occur on or after Budget Day, 2015. For taxation years after 2015, the LCGE for qualified farm or fishing property will be maintained at $1 million until the indexed LCGE applicable to capital gains realized on the disposition of qualified small business shares ($813,600 in 2015) exceeds $1 million. At that time, the same LCGE limit, indexed to inflation, will once again apply to the three types of property. It is estimated that this measure will reduce capital gains taxes on owners of farm and fishing businesses by about $50 million over the 2015–16 to 2019–20 period. Fred is 65 years old and has owned a farm in southwestern Ontario for the past 40 years. When Fred retires and sells his farm at the end of 2015, he will realize a capital gain of more than $1 million on his qualified farm property. The $186,400 increase in the LCGE for qualified farm or fishing property means that Fred may receive an additional $27,028 in federal tax relief that will support him in his retirement. Economic Action Plan 2015 proposes to amend the Canada Small Business Financing Act to allow more small businesses to apply for financing under the Canada Small Business Financing Program and allow larger loans to be made available. The Canada Small Business Financing Program facilitates the extension of loans by participating private sector financial institutions to small businesses for the acquisition of real property and equipment and for leasehold improvements by sharing the risk with financial institutions. The program helps new businesses get started; helps established firms make improvements and expand; improves access to loans that would not otherwise be available to small businesses; stimulates economic growth; and creates jobs for Canadians. Since 2006, the program has provided over 50,000 loans to small businesses totalling approximately $1 billion per year. Economic Action Plan 2015 proposes to amend the Canada Small Business Financing Act to: (1) increase the maximum loan amount for real property from $500,000 to $1 million; and (2) raise the small business eligibility criteria from firms with gross annual revenues of $5 million or less to firms with gross annual revenues of $10 million or less. In addition, Economic Action Plan 2015 proposes to increase the maximum duration of government coverage for real property loans from 10 to 15 years under the program. These changes will help enhance the ability of small businesses across Canada to secure capital to grow their business and create jobs. Serving over 32,000 entrepreneurs and providing over 8,000 small loans in 2013–14 alone, the Business Development Bank of Canada (BDC) plays an important role in helping Canadian small and medium-sized enterprises to grow and become more competitive, innovate, increase their efficiency and explore new markets, at home and abroad. By offering financial services that are complementary to those of other financial institutions in Canada, BDC works to ensure that small and medium-sized enterprises have the opportunity to grow and succeed. Minipi Lodges has been providing unique fly fishing adventures in Labrador for more than 50 years. As part of a comprehensive effort to help firms exploit digital technologies, BDC Consulting provided the company with a comprehensive Internet strategy, including an overhaul of its digital assets and a targeted e-marketing plan to build the company’s online presence. The investment is paying off in broadening the company’s reach to clients beyond the traditional U.S. Northeast market to other areas in the U.S., as well as Europe and Asia. Groupe Meloche, based in Salaberry-de-Valleyfield, Quebec, provides precision machining, surface treatment, painting and assembly and manufacturing engineering services to the aerospace and defence industries. With a growth rate of more than 25 per cent annually, the company has benefitted from the expertise and approach that BDC brings to this sector, including patient capital solutions that support ambitious investment strategies and the relatively long lead times to develop and bring innovative products to market. Marwood Metal Fabrication Ltd., a provider of steel and aluminum stampings and assemblies, as well as wire and tube products, to the automotive industry, is based in Tillsonburg, Ontario. The company has been a BDC client since 1994. Since then it has grown from 9 to over 450 employees. Marwood continues to grow and innovate, all as part of its long-term plan to support its growing global customer base. Magnum Cementing Services Operations, which is based in Alberta, provides oil companies across Western Canada with sophisticated primary and remedial oilfield cementing services. Formed in 2008, the company has received BDC financing for head office and satellite operations and achieved a track record of technical excellence, in-house equipment fabrication, innovation and integrity. Help high-impact small and medium-sized enterprises, which show a strong ambition to grow and succeed, to achieve their full potential. In the coming years, BDC will gradually implement a plan to facilitate access by these firms to tailored solutions at each stage of their development. With a strong pan-Canadian network of partners and a deep knowledge of opportunities and challenges facing entrepreneurs, BDC will leverage expertise drawn from the private sector, governments and other service providers, such as relevant non-profit organizations and academic institutions. Address the unique needs of high-growth firms (companies with annualized growth of 20 per cent for three consecutive years) with ambitions to pursue growth through an acquisition-based strategy. Entrepreneurs seeking financing in these situations can have few tangible assets to pledge as security but do not wish to dilute their ownership of the business. BDC will increasingly make available quasi-equity solutions in the $2 million to $10 million range to such entrepreneurs. This financing helps companies stay in business and remain in Canadian hands when they might otherwise cease operations or be acquired by foreign interests. Help small and medium-sized enterprises improve productivity and sales by financing the development and application of information and communication technologies (ICT). BDC is committed to providing $200 million per year in ICT loans and $300 million in venture capital investments in ICT firms as part of Digital Canada 150, the federal government’s digital economy strategy. Support regions exhibiting strong growth. With over 100 locations across Canada, BDC plans on opening 9 new business centres and 14 new shared offices over the coming years. Ensure small and medium-sized enterprises across Canada have a greater awareness of and easier access to business solutions. BDC will continue to work with a variety of stakeholders and partners, including Export Development Canada, Futurpreneur Canada and the 236 Community Futures Development Corporations with which it has partnership agreements, to extend its reach and support a healthy entrepreneurial ecosystem. Export Development Canada (EDC), Canada’s export credit agency, plays an important role in supporting small businesses seeking to export for the first time, to increase exports within existing markets or to expand to new ones. Over the last year, EDC has served more than 6,100 small and medium-sized enterprise (SME) customers. EDC supports SME customers by providing them with protection against a variety of risks with accounts receivable insurance, by fulfilling their need to access more working capital financing, and by facilitating their access to foreign markets with market information and introductions to potential buyers. This support is crucial to increase the presence of Canada’s small businesses in key developed and emerging markets and create new jobs for Canadians. Facilitate easy access to credit insurance for SMEs. EDC is launching an online self-service product that provides selective sales insurance coverage, primarily for the small end of the SME spectrum, in minutes. Provide tailored services for high-growth SMEs. EDC is expanding its SME Mentoring Program, which selects companies with high growth aspirations and provides additional customized assistance to help them break into new markets. Extend the corporation’s risk appetite to support SME business opportunities. EDC is tailoring its services to SMEs by “stretching” the corporation’s risk appetite in specific areas, such as providing a 100 per cent loan guarantee to domestic banks to encourage them to increase credit facilities for Canadian SMEs, and increasing the approval rate of SME requests for accounts receivable insurance for their foreign buyers. Up to $350 million to establish up to four large-scale private sector-led funds of funds in partnership with institutional and corporate investors as well as interested provinces. An aggregate investment of up to $50 million in established high-performing venture capital funds in Canada. Additional resources to continue developing a robust venture capital system and a strong entrepreneurial culture in Canada. Northleaf Venture Catalyst Fund is managing $233.5 million in new venture capital financing, which includes investments of $156 million from private sector investors and $38.75 million from each of the Governments of Canada and Ontario. Northleaf Capital Partners is seeking additional commitments to reach a target fund size of $300 million. Teralys Capital Innovation Fund is managing $279 million in new venture capital financing, which includes investments of $186 million from private sector investors and $46.5 million from each of the Governments of Canada and Quebec. This fund has an emphasis on investment opportunities in the life sciences sector. Teralys Capital is seeking additional commitments to reach a target fund size of $375 million. Kensington Venture Fund is managing $160 million in new venture capital financing, which includes investments of $107 million from private sector investors and $53 million from the Government of Canada. This fund has an emphasis on investment opportunities in clean technology and energy technology as well as information and communication technologies. Kensington Capital Partners is seeking additional commitments to reach a target fund size of $300 million. HarbourVest Canada Growth Fund is managing $197.2 million in new venture capital financing, which includes investments of $131.5 million from private sector investors and $65.7 million from the Government of Canada in the first close. Managed by HarbourVest Partners, the fund is focused on investment opportunities in the information and communication technologies sector, and is open to investors until the spring of 2016 to reach its target fund size of $375 million. Innovative, high-growth companies need financing as well as technical and managerial expertise to grow and create jobs. Recognizing these needs, the Government, in partnership with private sector investors and interested provinces, invested in four large-scale private sector-led funds of funds established under the Venture Capital Action Plan. The fund managers of the funds of funds are responsible for making investments that are market-oriented and focused on maximizing returns, managing the day-to-day activities of the funds of funds, and securing additional investments for the funds. Northleaf Venture Catalyst Fund has invested in XPV Water Fund II, Georgian Partners Growth Fund II, Versant Venture Capital Fund V, Version One Ventures II and Golden Venture Partners II, helping these underlying venture capital funds to achieve their close and commence investments in innovative, high-growth companies. Northleaf Venture Catalyst Fund has also invested directly in innovative, high-growth companies such as Wattpad (an online storytelling and publishing platform), Vision Critical (a customer intelligence and research firm), Silanis (a global leader in electronic signature services) and eSentire (a cyber-security service provider). Kensington Venture Fund announced investments in three underlying venture capital funds: Georgian Partners Growth Fund II, Novacap TMT IV and Walden Venture Capital VIII; and directly in Blue Ant Media, a high-growth media company that creates and distributes Canadian content internationally. The Government of Canada has also invested an aggregate of $50 million in four high-performing funds (Lumira Capital II, Real Ventures Fund III, CTI Life Sciences Fund II and Relay Ventures III) in Canada that focus on investment opportunities in the life sciences and information and communication technologies sectors. These investments are helping innovative businesses access the capital they need to grow and create jobs. The Government of Canada is implementing the Canada Accelerator and Incubator Program to help outstanding and high-potential incubator and accelerator organizations in Canada expand their support to entrepreneurs, supported by $100 million from Economic Action Plan 2013 and 2014. Business accelerators and incubators offer mentoring, financial support, business advice, commercialization support, office and development space and complementary services to entrepreneurs with a view to increasing the number of innovative firms that are investment-ready and able to develop into sustainable, high-growth businesses. Fifteen organizations were chosen to advance in the selection process under this program and, to date, funding has been awarded to 14 organizations across Canada. Program recipients are located in every Canadian region. Economic Action Plan 2015 proposes to provide $14 million over two years, starting in 2015–16, to Futurpreneur Canada to support young entrepreneurs. Entrepreneurship is critical to fostering innovation, economic growth and improvements in quality of life. The Government is committed to providing young entrepreneurs with the tools they need to become the business leaders of tomorrow. Futurpreneur Canada is a national not-for-profit organization that helps young entrepreneurs become successful business leaders through mentorship, learning resources and start-up financing. Since its inception in 1996, Futurpreneur Canada has helped more than 7,500 young entrepreneurs launch over 6,200 businesses. The Government has provided Futurpreneur Canada with over $58 million in support since 2006. Economic Action Plan 2015 proposes to provide $14 million over two years to Futurpreneur Canada, starting in 2015–16. Through Futurpreneur Canada, the Government will help young entrepreneurs access financing and mentoring, thereby contributing to small business growth and success. This funding is conditional on Futurpreneur Canada raising matching funds from non-federal sources. Economic Action Plan 2015 announces support for the Action Plan for Women Entrepreneurs in order to help women entrepreneurs succeed, through mentorship and increased access to credit and international markets. The Government is committed to continuing support for women entrepreneurs to grow their businesses. Through the new Action Plan for Women Entrepreneurs (Action Plan), the Government is helping to connect women with the tools they need to succeed in business. This includes a series of initiatives targeted at supporting women entrepreneurs through mentorship, networking opportunities, and increased access to financing and international markets. Economic Action Plan 2015 announces that the Government will support the Action Plan for Women Entrepreneurs. Key initiatives under the Action Plan include: an online platform to foster networking; the “Just One Pledge” campaign to encourage mentorship and championing; enhanced trade missions for companies led by women entrepreneurs; the Business Development Bank of Canada making available $700 million over three years to finance women-owned businesses; and a national forum to bring together women entrepreneurs and provide them with tools, networks and connections they need to reach their full growth potential. Saving Canadian businesses over $22 million in administrative burden, as well as 290,000 hours in time spent dealing with red tape, through the One-for-One Rule, whereby regulators must remove a regulation each time they introduce a new regulation that imposes administrative burden on business. Posting 34 new service standards and over 100 pre-existing service standards in compliance with the requirements of the Action Plan, making the approval process for complying with regulations more transparent for businesses. Making the regulatory system more predictable by publishing 40 forward regulatory plans highlighting upcoming regulatory changes and containing over 400 anticipated regulatory initiatives, with all major regulators covered. Fulfilling a commitment under the Action Plan by completing and releasing the Administrative Burden Baseline initiative’s count of regulatory requirements. As of June 30, 2014, the Government of Canada had a total of 129,860 federal requirements in regulations and related forms that imposed administrative burden on businesses in Canada. Federal departments will update this count annually to contribute to openness and transparency in the monitoring and reporting of red tape. The Government has also followed through on its commitment to legislate the One-for-One Rule, making Canada the first country to introduce legislation for such a rule. Over the next year, the Government will build on its record of reducing red tape to encourage an environment more conducive to the growth and success of small businesses. To further improve the overall conditions for business investment, the Government will also continue to modernize Canada’s legal and regulatory frameworks in the area of corporate governance. A fair and well-functioning tax system facilitates compliance and simplifies administration. Through ongoing review and revision of the tax system and its administration, the Government has made important advances in reducing the tax compliance burden. The Government’s sustained approach to reducing the administrative burden associated with the tax system has made a significant contribution to the broader initiative to eliminate unnecessary red tape. A PwC study analyzing the ease of paying taxes in 189 countries, titled Paying Taxes 2015, reflects the positive impact of the Government’s systematic approach to reducing the tax compliance burden. According to the study, it takes 25 per cent less time for a business in Canada to prepare, file, and pay its taxes each year than is the case for a business in the United States. The Canada-Ontario Tax Collection Agreement was amended to provide for federal administration of Ontario’s corporate taxes for taxation years that end after 2008. PwC estimated that this change reduces compliance costs by more than $135 million annually for Ontario businesses, by allowing for a single annual tax form, a single tax collector and one set of income tax rules. The streamlining of sales taxes has resulted in substantial savings to businesses in Ontario and Prince Edward Island. For example, the Province of Ontario estimates the savings for businesses in Ontario to be in excess of $500 million annually, as businesses now only have to file and remit a single sales tax. Budget 2007 and Economic Action Plan 2014 reduced the frequency of required tax remittances and filings for small businesses in respect of income taxes, source deductions and sales taxes. These measures continue to reduce the paperwork burden, eliminating the requirement for an estimated 8.7 million filings and remittances annually for more than 970,000 small and medium-sized employers. The Government is continuing to reduce the tax compliance burden through new actions in Economic Action Plan 2015. In addition, the Government intends to continue the consultation launched in Economic Action Plan 2014 on the conversion of eligible capital property into a new class of depreciable capital property. Economic Action Plan 2015 proposes to assist the smallest new employers by reducing the frequency of required remittance payments by two-thirds. An estimated 80,000 new employers each year will benefit and an estimated 640,000 required payments to the Canada Revenue Agency will be eliminated annually. Throughout the taxation year, employers are required to withhold from employee wages amounts in respect of personal income tax and the employee portions of Canada Pension Plan (CPP) contributions and Employment Insurance (EI) premiums. Businesses then remit these withholdings to the Government, along with the employer portions of CPP contributions and EI premiums. Currently, new employers must remit withholdings monthly for at least one year. After that, they may be eligible to apply for quarterly remitting if they have an average monthly withholding amount of less than $3,000 and have demonstrated a perfect compliance record over the preceding 12 months. The requirement to remit withholdings monthly until a track record has been established can be onerous for new businesses and other small employers, such as families that hire someone to help care for a child or ailing relative. To make it easier for the smallest new employers to file and pay taxes, Economic Action Plan 2015 proposes to reduce the number of remittance payments that new employers must prepare and submit to the Canada Revenue Agency. Beginning in 2016, new employers will be eligible for quarterly remitting if they have monthly withholdings of less than $1,000 and maintain a perfect compliance record in respect of their Canadian tax obligations. This amount of withholdings corresponds to the withholdings related to one employee at a salary of up to $43,500, depending on the province of residence. The proposed changes will mean that, each year, an estimated 80,000 new employers will see their number of required remittance payments cut by two-thirds, eliminating the requirement for an estimated 640,000 payments each year. While this measure will not affect the amount of tax owing, it is estimated that changes in the timing of remittances will increase public debt charges by about $4 million over the 2016–17 to 2019–20 period. Economic Action Plan 2015 proposes to review the rules used to define active versus passive income. The small business deduction is available on up to $500,000 of active business income of a Canadian-controlled private corporation. Stakeholders, such as self-storage facilities and campgrounds, have expressed concern as to the application of the rules used to define passive versus active business income. To continue to improve the fairness and simplicity of the tax system, the Government will conduct a review of the active versus passive business income rules for purposes of the small business deduction. Economic Action Plan 2015 announces the Government’s commitment to undertake the initial planning and preparation required for federal adoption of the Business Number as a Common Business Identifier. In addition, Economic Action Plan 2015 proposes to give the Minister of Employment and Social Development and the Minister of Labour the authority to collect, use and verify Business Numbers to administer business-facing programs for which they are responsible. The Government is continuing to cut red tape and expand electronic services for businesses. Economic Action Plan 2015 announces the Government’s commitment to undertake the planning and preparation required for federal adoption of the Business Number, and its initial implementation. The Business Number is a nine-digit number that the Canada Revenue Agency assigns to a business (or other organization such as a charity) for tax matters. Under the proposed approach, a business dealing with the federal government would only have to register once to be eligible to access a range of federal programs and services for businesses, instead of having to register separately under each federal service or program. This would make it simpler for businesses to interact with government, reducing red tape and enabling more efficient digital self-service. In addition, Economic Action Plan 2015 proposes to give the Minister of Employment and Social Development and the Minister of Labour the authority to collect, use and verify Business Numbers to administer business-facing programs for which they are responsible (i.e., programs that involve direct dealings with businesses). The use of Business Numbers will allow a single identifier to be used to electronically register, provide and update information for multiple government programs. This will reduce paper burden, simplify registration, eliminate duplication, and help businesses access Government services in a more effective manner. Economic Action Plan 2015 proposes to provide an exception to an income tax withholding requirement for qualifying non-resident employers in respect of payments made to non-resident qualifying employees who have an exemption from Canadian income tax because of a tax treaty. An employer (including a non-resident employer) is generally required to pay amounts to the Canada Revenue Agency as deductions from an employee’s salary or wages. Amounts paid are held on account of the employee’s Canadian income tax owing. This requirement, known as “Regulation 102”, is a requirement for all employees working in Canada, even if the employee is a non-resident who is exempt from Canadian income tax because of a tax treaty. In these circumstances, if the non-resident employee files a Canadian income tax return, the Canada Revenue Agency will refund all paid amounts. Economic Action Plan 2015 proposes to streamline the Regulation 102 tax compliance requirements for non-resident employers in relation to non-resident employees working in Canada. Specifically, it is proposed that qualifying non-resident employers be exempted from Regulation 102 tax compliance requirements for non-resident employees where a tax treaty applies and certain other conditions are met. It is estimated that this measure will reduce federal revenues by about $8 million over the 2016–17 to 2019–20 period. Economic Action Plan 2015 proposes to amend the penalty for the repeated failure to report income to apply in a taxation year only if a taxpayer fails to report at least $500 of income in the year and in any of the three preceding taxation years. Penalties may apply when taxpayers fail to report all of their income on their income tax returns. Penalties are designed to promote compliance, while being fair and proportionate. Where a taxpayer fails to report an amount of income in a taxation year and had failed to report an amount of income in any of the three preceding years, the taxpayer is liable to a penalty equal to 10 per cent of the unreported income for that taxation year. Another penalty (the “gross negligence” penalty) applies if the taxpayer knew or, under circumstances amounting to gross negligence, ought to have known that an amount of income should have been reported. The amount of this penalty is generally equal to 50 per cent of the understatement of tax payable (or the overstatement of tax credits) related to the omission. The penalty for repeated failure to report income does not apply if the gross negligence penalty applies. Because the penalty for a repeated failure to report income is based on unreported income, rather than the understatement of tax, it can sometimes impose a greater penalty than would have been the case if the gross negligence penalty had instead applied. This result could arise, for example, with a lower-income taxpayer that has failed to report income on which tax was withheld at source. an amount equal to 50 per cent of the amount by which the understatement of tax (or the overstatement of tax credits) related to the omission exceeds the amount of any tax paid in respect of the unreported amount (e.g., by an employer as employee withholdings). It is estimated that this measure will reduce federal revenues by about $45 million over the 2016–17 to 2019–20 period. The Government has continuously engaged small and medium-sized businesses to cut red tape. Collaboration with stakeholders is essential to ensure that the Government’s red tape reduction actions make a real difference for small businesses. Stakeholder organizations that represent small business owners, such as the Canadian Federation of Independent Business (CFIB), are playing a vital role in helping the Canada Revenue Agency (CRA) improve and enhance its service offerings to small and medium-sized businesses. Requiring CRA enquiries agents to use a standard Agent ID when dealing with a business, making it easier for business owners and representatives to provide feedback on CRA services. Launching its first mobile reminder app for businesses. Using the Business Number as a common identifier to simplify a business’ dealings with federal, provincial and municipal governments. Expanding online payment options with the launch of pre-authorized debits. Starting in 2015, the Government will strengthen its partnership with small businesses by launching a new Small Business Consultation Forum involving the CRA and the CFIB. The Forum will meet twice a year and provide the CRA with feedback from the small and medium-sized business community to ensure their needs are reflected in the administration of the Canadian tax system. The CRA will partner with the CFIB and other stakeholders to raise awareness of the CRA’s services in the small business community, including the ongoing expansion of its online services. The CRA will continue to improve the use of plain language in its communications products, with a focus on the 100 most commonly used messages to taxpayers. Building on the My Business Account Enquiries Service, the CRA will work to ensure that taxpayers can rely on written information received in a letter from the Agency and on the CRA website. The CRA will continue to help business owners get it right from the start by establishing the Liaison Officer Initiative as a permanent program. Through this initiative, CRA audit staff offer meetings to business people to discuss tax requirements, respond to questions and provide tips on avoiding common errors particular to their type of business. The CRA will develop a plain-language publication that will provide information to help businesses understand and prepare for the CRA audit process, including their rights, responsibilities and the recourse available to them. Economic Action Plan 2015 proposes to modernize Canada’s federal corporate governance framework to increase women’s participation in corporate leadership, improve shareholder democracy and communications, strengthen corporate transparency and reduce the regulatory burden on Canadian businesses. Recognizing that increasing opportunities for women to serve on corporate boards and in leadership roles makes good business sense, the Government will propose amendments to the Canada Business Corporations Act to promote gender diversity among public companies, using the widely recognized “comply or explain” model of disclosure currently required for TSX-listed companies and by most provincial securities regulators. Amendments will also be proposed to modernize director election processes and communications with shareholders and to strengthen corporate transparency through an explicit ban on bearer instruments, through which the identity of the owner can be concealed. Amendments to related statutes governing cooperatives and not-for-profit corporations will also be introduced to ensure continued alignment among federal laws.